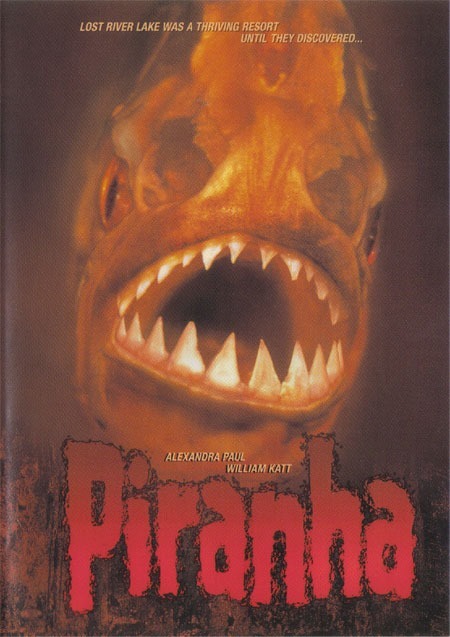 Piranha (1995)–Just How Many Remakes of Piranha Are There?!?! So I found my self with a little extra time on my hands and decided to watch the 1995 version of the Rodger Corman classic, Piranha. Now, you might be thinking that you read one, no two reviews of Piranha on this blog already. You’re right, and now here’s a third. This 1995 release has a new story (mostly) and new actors but reuses the actual piranha attack clips from the original 1978 release – Hey, it’s good to recycle, right?. Like all Piranha movies, the fish are accidentally released into a river or lake (river that dumps into a mam made lake this time), and a few good people have to convince some bad people to cancel an even that takes place at a beach. And like all other Piranha movies, the bad people refuse to believe them until it’s too late. There really isn’t anything in this version that screams must watch, though it is fun. One little tidbit: the young daughter of the main character, Paul Grogan (played by William Katt of The Greatest American Hero), is played by a very young Mila Kunis. I did not know this while watching the movie, and despite not having a lot of lines, I was thinking that this child actor is the only one in the whole movie that seems believable. Looking up the cast after I was done watching is when I found out it was Mila – good job! So, to summarize: This version of Piranha doesn’t bring anything new to the table an early performance by Mila Kunis), but it is fun nonetheless,and if you like these B-Movies then this one is as good as most and might bring a smile on a boring afternoon. This entry was posted on July 2, 2013 by catfishman. It was filed under 1970's, 1980's, 90's, abduction, animals, Awesome, b movies, bad, comedy, confusion, Corman, cover up, crappy, crazy, crime, death, different, drive in, dumb, entertaining, entertainment, family, film, fun, funny, good, Grindhouse, gritty, horror, humanity, injustice, kidnapping, killers, lake, Mob, movies, murder, Piranha, resort, reviews, sacrifice, scary, Sci-fi, science, Science Fiction, silly, stupid, Summer, theatre, trailers, watch and was tagged with 1970s, 1980s, 90's, abduction, animals, awesome, B Movies, bad, comedy, confusion, Corman, cover up, crappy, crazy, crime, death, different, drive in, dumb, entertaining, entertainment, family, film, fun, funny, good, Greatest American Here, grindhouse, gritty, horror, humanity, injustice, kidnapping, killers, lake, MEg Griffin, Mila Kunis, mob, movies, murder, piranha, resort, reviews, sacrifice, scary, sci-fi, science, science fiction, Shut up Meg, silly, stupid, summer, theatre, trailers, watch, William Katt.